The look, the color, texture and even the fragrances are maintained. The process replaces natural plant fluid with a preservative. The trunk of the preserved palm tree is hollow. The result is a realistic plant environment constructed to specified measurements. Watering, pest control, auxiliary lighting, skylights, replacement due to plant mortality or due to outgrowing of space, special planters … are no longer necessary. Architects and designers can now plan the palm trees in the projected environment and design the height, shape, and type of tree that will be used. Three preserved palm trees with integrated monitors. The first palm plays a continuous loop of a video. We see the architectural surface of Orange County and hear the story of Vi Vuong, a Ph.D. student at UC Irvine. “Another Day in Paradise” is the motto of the city of Irvine in Orange County, California. Incorporated in 1971, it is renowned as one of the largest, most successful planned communities in the nation. Here, we can glimpse into the future living environments—an ideal represented. Our Town, circa, 1993. An hour’s drive south of Los Angeles, past Disneyland, the Nixon Library, and John Wayne airport, the American Dream personified. Inspired by Disneyland, this model city is carefully studied by developers and architects from around the world. Only ten minutes away are the nation’s preeminent shopping malls—Fashion Island and South Coast Plaza and it is a major magnet for international business, the prototype of the new multinational city. The chairman of the Irvine Company who practically owns the town, calls the Irvine property his “raw canvas” and plans to devote the rest of his life to its development. A spectacular 100-square-mile canvas just waiting to be filled with the familiar landmarks of the late 20th century commercial civilization-—office parks, housing tracts, and shopping malls, crisscrossed by highways. Vi Vuong fled with a group of other 14-year-olds on a boat at the urging of their mothers who didn’t want them to grow up to die to finally land at John Wayne Airport. An estimated of 600,000 of ” boat people” have drowned trying the similar route of escape. Oddly, the largest Vietnamese community settled in Orange County next door to the Nixon library. 1993 marks 20 years since the “end” of war with Vietnam. Since then it has been a subject of thousands of books, articles, and scores of motion pictures and documentaries. And yet, this country has still not come to grips with the idea that it has actually lost the first techno-war. 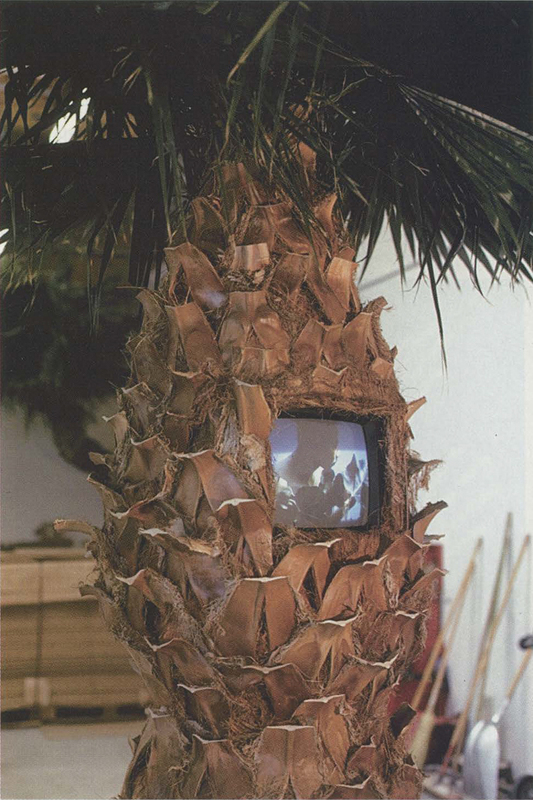 The second palm has hidden surveillance cameras in the fronds and the monitors mirror the viewer and the immediate surroundings. It is silent. The third tree is interactive with an integrated computer that allows the viewer to “scratch” below the surface. This palm houses a collaborative effort with excerpts of “Monkeybone Take Me Home” and The Sacred and the Toxic” by Sean Kilcoyne and footage from the daily life in Vietnam by Kathy Brew. The media emblems of the Vietnam war are challenged by images of people who are trying to pick up the pieces and go on with their lives. The preservation process of palms is the bed on which these images and stories unfold.